The global PV market in 2009 encompassed two distinct stories. In the first half of the year, project financing fell off as global financial markets reeled and new project funds largely were placed on hold. What little equity capital was available for projects came at a higher cost, necessitating module price declines in order to maintain sufficient project returns. This placed substantial margin pressure on manufacturers, who sought price reductions further upstream. On the supply side, the primary price reduction source was polysilicon. A shortage of solar-grade polysilicon had driven spot prices from less than $30/kg in 2001 to over $500/kg in mid-2008 despite production costs well below $100/kg. 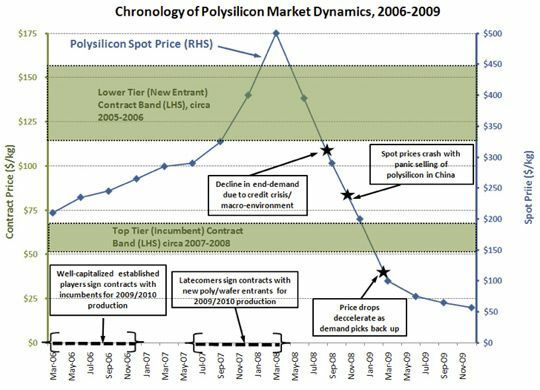 As demand began to decline at the outset of the global financial crisis, spot prices for polysilicon plummeted to less than $100/kg by April 2009 and ~$60/kg by mid-year, a stunning 88 percent decline over twelve months. Helped by this and reeling from the sudden drop-off in demand, crystalline silicon PV manufacturers drastically lowered prices. 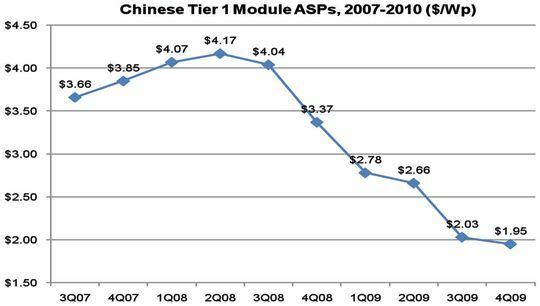 By the fourth quarter 2009, Chinese manufacturers had dropped module ASPs to below $2.00/W. The combination of structural overcapacity and demand drop-off exerted extreme upstream pressure. Three factors contributed to the considerable demand recovery experienced in the second half of 2009. First, global financial markets entered the early stage of recovery, bringing project capital costs down slightly. Second, the drastic decline in module ASPs enabled attractive returns in previously limited markets such as the Czech Republic, as well as justifying higher costs of capital. Finally, attractive returns coupled with concerns regarding 2010 feed-in tariff cuts in Germany resulted in a rapid demand pull into the German market in the third and fourth quarters. Germany proved to be the market's saving grace, absorbing excess inventory and installing 3,261 MW in the second half of the year. In 2009, global PV demand reached 7,118 MW, of which 3,806 MW, or 53 percent, came from Germany. Demand growth was 24 percent over 2008, when 5,751 MW were installed on the back of a 2,511 MW demand boom in Spain. In 2009 Spain's 500 MW feed-in tariff cap was reached. But over 350 MW of that had been installed in the rush that occurred in the final months of 2008 and was simply awaiting grid connection. As a result, less than 150 MW of new installations were put in the ground. The demand collapse in Spain, along with the South Korean market drop from 276 MW to 98 MW, was offset by large demand gains in Germany, Japan, the Czech Republic, and Italy, coupled with incremental growth in most other secondary and tertiary markets. However, had it not been for Germany's ability to ramp up so rapidly in the second half of the year, global demand would have remained well below 2008 levels. 2010 will be another volatile year for the global PV market. Germany and France have already implemented new feed-in tariff rates as of January 2010. Germany's feed-in tariffs will be altered again on July 1. Italy will announce a new incentive scheme to take effect in 2011. 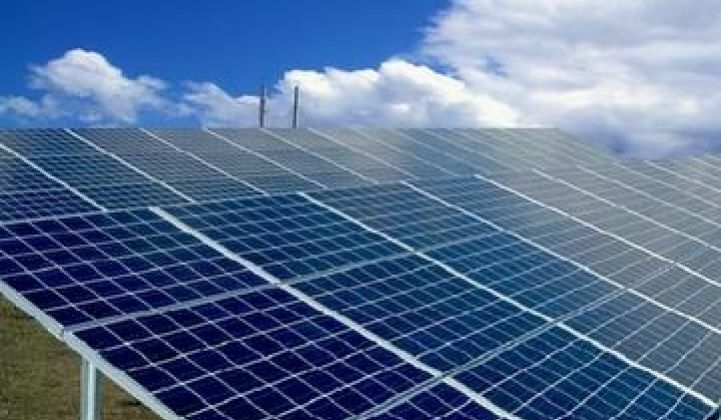 The Czech Republic and Spain are both likely to introduce new feed-in tariff rates during the year. The U.K., Israel, and a number of U.S. states either have already, or are planning to, introduce new feed-in tariffs. And 2010 will be a crucial test year for new incentive programs in China, India, and Canada. In general, national incentive rates are in decline. Hard lessons have been learned from the overheating of PV markets in Spain, the Czech Republic, and Germany. The global market has been operating under a gold-rush mentality in which product is raced into the next "hot" market until incentives are necessarily pared back. This renders policymakers wary of offering overly attractive programs and ultimately paying a short-term political -- and long-term economic -- price. In 2009, the impacts of the global financial crisis masked this effect, and it was easy to blame margin compression and poor earnings on the current economic situation. But as the German market settles in the second half of 2010, structural overcapacity will show itself more clearly in underutilization of manufacturing facilities and further pricing pressure from purchasers. The buyer's market remains in place, and given planned capacity expansions from major manufacturers, it is likely to be an ongoing market state. While secondary market growth in the second half of 2010 (Italy, U.S., France) may mask the impacts of overcapacity this year, Germany's decline in 2011 will produce a difficult year for global PV manufacturers. Historically, the stagnation or collapse of a primary national market has been accompanied by absorption into a second, "champion" market. When Japan's residential subsidies began to fall off in 2004, upward revisions in Germany's feed-in tariff program enabled demand to shift toward the German market. Germany's slow growth in 2007 and 2008 brought a flight to Spain, where the market grew nearly 600 percent in 2008. And in 2009, Spain's collapse shifted demand back to Germany, which grew 153 percent. In 2010, the German government intends to limit demand through lower feed-in tariff rates and the elimination of tariffs for ground- mount systems on arable land. However, there is no hard cap on the market, so demand will be determined by whether project returns remain attractive in the face of tariff cuts. In 2009, Germany had a similar (albeit less severe) mechanism in place intended to place demand within a growth corridor of 1,000 MW to 1,500 MW. Obviously, this strategy was unsuccessful, and despite the additional 2 percent digression the German government enacted for 2010, module prices fell sufficiently to enable attractive returns this year. However, the mid-year feed-in tariff cuts will be another story. Early indicators suggest that second-half demand will fall substantially in Germany, although module ASPs may fall sufficiently to enable a mini-boom in the fourth quarter ahead of strict 2011 tariff cuts. If Germany is successful in constraining demand in the second half (even above its intended levels), 2010 will become the first year in which no champion market emerges as the market of last resort for excess inventory. No other market is capable of both supporting sufficient volume and ramping up as quickly as Germany did in 2009 and Spain did in 2008. While the United States has the volume potential, its fractured market state, combined with slow project development timelines, will limit its ability to rapidly scale up, and growth there will likely occur over a longer period. Italy's market growth will be substantial, but the market will be constrained by slow permitting cycle time. Instead, 2010 will mark the beginning of a global diffusion of demand. Rather than being focused around a single demand center, there will be a class of major markets that each absorb a substantial portion of demand growth. These markets will be spread throughout the globe, with growth occurring on a similar scale in North America, Europe, and Asia. In the long term, this will be beneficial to the market, shielding suppliers from individual regulatory changes and minimizing the boom/bust cycle. But in the meantime, look for shaky growth and continued consolidation in the global PV market. This article is excerpted from the newly released GTM Research report 2010 Global PV Demand and Analysis. For more information on the report's contents, download the free executive summary at http://www.gtmresearch.com/report/2010-global-pv-demand-analysis-and-forecast.